People ask with some regularity how FreshRosary.com got it’s start, and the surprising answer is, that after 20+ years as a floral artist, I make a simple design mistake that almost paralyzes me. My friend Kellie asks me to arrange the funeral flowers for her dynamic, holy, and spirit-filled mother, Barbara. 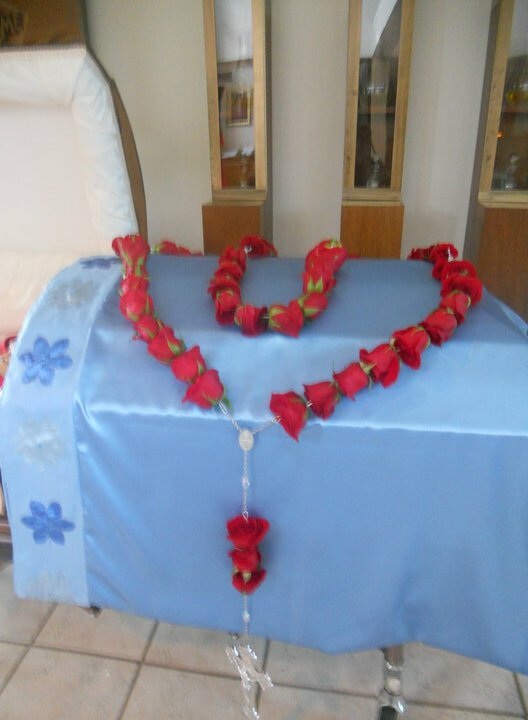 She specifically wants a rosary of fresh roses. Beyond the rosary, Kellie gives me carte blanche, so I also design corsages for her and her sisters, a boutonniere for their dad, bud vases for the reception, and a ‘Divine Mercy’ floral cross on an easel — which looks really cool, but that’s another story. I’d created fresh flower rosaries before, for my brother’s funeral, and for a Catholic women’s day of reflection, so I know what to do. I buy the red roses and the rosary kit, set to work, and realize I’d completely forgotten the most important factor — those roses are supposed to be “sweetheart” size — which is about 1/3 the size of the giant roses on hand. Imagine the size difference between a shooter marble and a racquetball, if you’re old enough to know what a shooter marble is. The typical rosary kits available to florists have chain and beads connected by wires, with little serrated metal cones on them, which are meant to grip the roses. You pinch a rose hip into each cone along these wires, until you’ve built a complete rosary. But the cones are much too small to accommodate the monster roses laying in front of me. See how huge the rose hip is? It’s not going to fit into that little cone. No way. As I mull over — OK, fret and agonize about — all the possible and time-consuming fixes to my problem, Kellie calls. She lives two+ hours drive away, and said she’d call when she hit the road. “I’ll be there in 45 minutes!” she sings. Wait, what? I thought I had at least a couple of hours to create this thing. “Okayyy!” I answer. Suddenly I need a “Hail Mary Pass,” to have any hope of avoiding major floral catastrophic failure. And the stunning thing is, I know EXACTLY what this means! 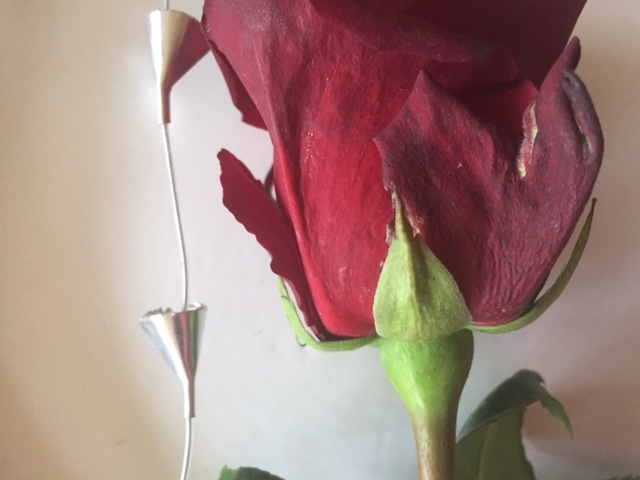 I go to my supply room, grab a roll of flexible aluminum wire, do a “Morticia Adams” maneuver on all the roses, shish-kabob them, link everything together, and gasp! The largest floral rosary I’ve ever seen, springs to life in front of me! This is the true and simple story. I lay the rosary on a bath towel folded lengthwise into a large floral shipping box, mist it, close the lid and send it with Kellie, who arrives about ten minutes later, her SUV idling in the driveway. That night at the rosary service, when friends and family behold this massive, beautiful tribute to Our Blessed Lady, many gasp, and weep openly. Emotional healing, restored relationships, comfort so real it’s like a warm blanket — all these things come to life, simply because of roses too big for their hardware, and the timely, heavenly solution from Barbara herself. Nobody can convince me otherwise.